Longstanding wisdom in the ICT4D community dictates that you need to conduct a hard sales job to convince more traditional communities and/or stakeholders to use ICT services. My current research in Cambodia is challenging this notion. For the past five weeks I’ve been in Cambodia working with DAI’s Development Innovations project to interview their grantees, largely Cambodian nongovernmental organizations utilizing ICT services in their civil society work for the first time. Their deployments are as diverse as an IVR hotline for commune services and an app for remote WASH supply chain management. I’ve been talking with grantees about what they’ve learned in the process of doing the often challenging work of designing and launching successful ICT4D services. Many of the lessons they’ve shared are familiar to those of us who have worked in the sector: technology takes a long time to build; designing with the user is crucial; rural connectivity is still a challenge in a lot of places. Some of them, however, have been unfamiliar—end users, even rural, older populations, did not need the hard sell to use these tools. When asked about what surprised them during the grant process, across the board, grantees were shocked at how eager their end users were to engage with the services they had developed. Communities and beneficiaries immediately recognized the benefits of ICT in replacing of traditional, analog processes, and had the will to learn how to use them. Perhaps, the technology tipping point has been reached: The challenges in getting people to utilize new technologies have been overcome by a world swamped in them. This surprised me too. There are always two main challenges in planning a new ICT project: getting the design right, and then convincing the end user to use it. We’ve seen this with deployments as large as national mobile money systems and as small as community-based text message information alerts. Even nongovernmental groups that haven’t used ICT before in their work understand this: Introducing anything new to people—no matter who they are, how well designed it is, and how useful it is—is always hard. That’s why we have the Diffusion of Innovations theory, and those sweet early iPod ads (look at those baggy khakis!). This also explains why our grantees were surprised that even when entering their rural village pilot sites, armed with tablets and a smile, they were greeted by eager students excited to learn how to use these new tools, rather than the reticent and dismissive training audience they were expecting. And this was not a group of social media-obsessed youths—this was a training session for older community leaders and village heads, many of whom had never even held a smartphone. Let the learning begin! So what’s going on? 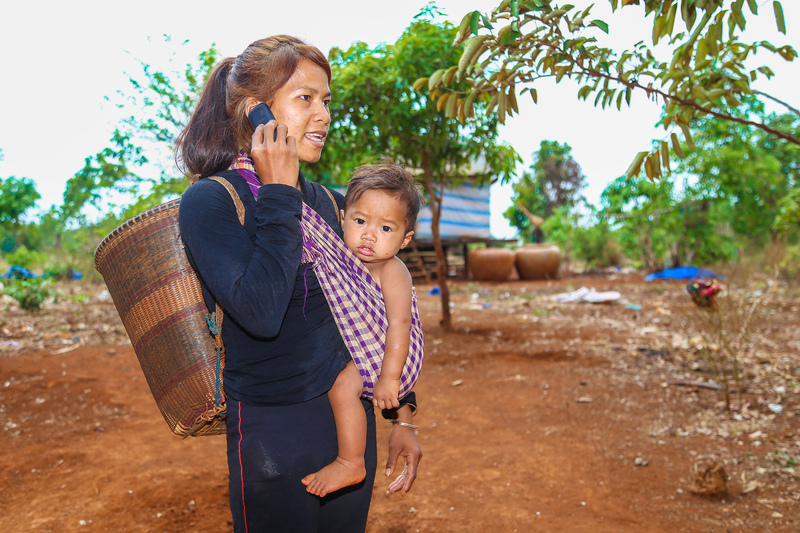 Why are older Cambodians, even in rural areas, so willing to try new technologies? My first theory is that a lot of this has to do with Facebook. Most people on the planet have heard about Facebook at this point, and those who don’t have an account have either a) seen a family member or friend playing with it, or b) heard about it via word of mouth or traditional media. The Zuckerburg mythology runs strong, especially in these parts of the world, and people are eager to see what the fuss is about. A digital fear of missing out, if you will. My second theory is that because smartphones are so widely adopted, even in places where we don’t expect them (see all of DAI’s Digital Insights research on this), the presence and utility of technology is just far more accepted. Through repeated exposure from friends/family/community/media, even the technophobic have become technocurious. It’s exciting to know this—one big barrier to ICT4D may have been cleared by two factors: the market and time. Still this forces us to ask ourselves, what about sustained usage? Uptake certainly does not equal robust usage, and design is an important driver in ensuring a service is actually used. Perhaps what this means is that we now can focus our efforts on truly robust and user-centered design; knowing that finally, if we build it, and build it well, they will come. Reader, have you seen this in the markets you work in? If so, please let me know in the comments. I’m truly curious to know if others are witnessing this same tipping point phenomenon in their work.